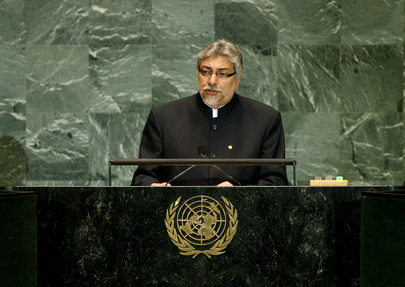 FERNANDO LUGO MÉNDEZ, President of Paraguay, stressed the sanctity of life as central to the work of the United Nations. Its Charter stressed the preservation of future generations as its primary goal, yet a murderous onslaught of warplanes continued to kill children and other civilians around the world. Countries continued to inflate their military budgets, labelling them “defence” funds. Not only was that perverse game corroding the future, but people around the world were trading a rifle for a container of vaccine or a warplane for a public health budget. Indeed, too many countries were seduced by the trade of death. But Paraguay, declaring before the world its absolute commitment to peace, would not mortgage its daily bread “to dance the blind death of warlords”. Globalization called for a new world economic order that would eliminate unequal access to the benefits of development, he said. A little more than a year ago, Paraguay had been in tatters, but the country was now working to balance its economy, strengthen democratic processes and eliminate severe social differences. The international community used terms like “developing”, “middle income” or “least developed”, which papered over the pathetic situation in which those countries continued to suffer while other nations benefited at their expense. He said a new economic order had specific aims: promoting and strengthening small economies on the basis of fair and equitable distribution of the benefits of wealth; ending unfair trade practices; and ensuring the healthy political development of all nations without undue interference from larger, more powerful ones. In that regard, he expressed concerns about events in Honduras following the savage coup d’état there. Elsewhere, concrete solutions were needed to international conflicts. Global warming also had to be curbed, and particularly the situation of the peoples of the South, who were forced to deal with the effects of climate change despite the North’s role in causing most of that change, must be addressed. Accomplishing those goals would prove to be an epic fight subject to major challenges and difficulties, he conceded. But surely it could be won in the twenty-first century. In promoting peace and social development, the United Nations could play an important role, yet there was no time to lose. Ensuring justice and repairing the acrimonious history between rich and poor countries must be a priority on the agenda of the United Nations. The Organization should, in turn, be reformed, particularly the Security Council. Meanwhile, the economic crisis remained a concern, as did the persistent blockade of Cuba by the United States, and the global arms race.